What are the early signs of Alzheimer's disease? Is there a way to prevent Alzheimer's disease? Are there any sources of financial help for people with Alzheimer's or their caregivers? Alzheimer's disease is a type of dementia. Dementia is a loss of thinking, remembering, and reasoning skills that interferes with a person's daily life and activities. Alzheimer's disease is the most common cause of dementia among older people. Other types of dementia include frontotemporal disorders and Lewy body dementia. Learn more about Alzheimer's disease and dementia. Memory problems are typically one of the first signs of Alzheimer's disease, though different people may have different initial symptoms. A decline in other aspects of thinking, such as finding the right words, vision/spatial issues, and impaired reasoning or judgment, may also signal the very early stages of Alzheimer's disease. Mild cognitive impairment, or MCI, is a condition that can also be an early sign of Alzheimer's disease—but not everyone with MCI will develop Alzheimer's. In addition to memory problems, movement difficulties and problems with the sense of smell have been linked to MCI. Learn more about the signs of Alzheimer's disease. Alzheimer's disease progresses in several stages: preclinical, early (also called mild), middle (moderate), and late (severe). During the preclinical stage of Alzheimer's disease, people seem to be symptom-free, but toxic changes are taking place in the brain. A person in the early stage of Alzheimer's may exhibit the signs listed above. As Alzheimer's disease progresses to the middle stage, memory loss and confusion grow worse, and people may have problems recognizing family and friends. As Alzheimer's disease becomes more severe, people lose the ability to communicate. They may sleep more, lose weight, and have trouble swallowing. Eventually, they need total care. Learn more about the stages of Alzheimer's disease. Scientists do not yet fully understand what causes Alzheimer's disease in most people. In early-onset Alzheimer's, which occurs between a person's 30s and mid-60s, there may be a genetic component. Late-onset Alzheimer's, which usually develops in a person's mid-60s, arises from a complex series of brain changes that occur over decades. The causes probably include a mix of genetic, environmental, and lifestyle factors. These factors affect each person differently. Learn more about the factors that influence Alzheimer's disease. 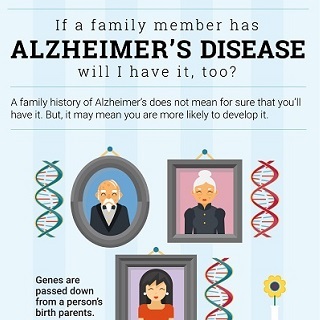 Just because a family member has Alzheimer's disease does not mean that you will get it, too. A rare form of Alzheimer's disease, called early-onset familial Alzheimer's, or FAD, is inherited (passed down through families). It is caused by mutations, or changes, in certain genes. If one of the gene mutations is passed down, the child will usually—but not always—have FAD. In other cases of early-onset Alzheimer's, research suggests there may be a genetic component related to other factors. Most cases of Alzheimer's are late-onset. This form of the disease occurs in a person's mid-60s and usually has no obvious family pattern. However, genetic factors appear to increase a person's risk of developing late-onset Alzheimer's. Learn more about assessing risk for Alzheimer's disease. Some sources claim that products such as coconut oil or dietary supplements such as Protandim® can cure or delay Alzheimer's. However, there is no scientific evidence to support these claims. Currently, there is no cure for Alzheimer's disease. The U.S. Food and Drug Administration (FDA) has approved several drugs to treat the symptoms of Alzheimer's disease, and certain medicines and other approaches can help control behavioral symptoms. Learn more about how Alzheimer's disease is treated. Scientists are developing and testing possible new treatments for Alzheimer's. Learn more about taking part in clinical trials that help scientists learn about the brain in healthy aging and what happens in Alzheimer's and other dementias. Results of these trials are used to improve prevention and treatment methods. Currently, there is no definitive evidence about what can prevent Alzheimer's disease or age-related cognitive decline. What we do know is that a healthy lifestyle—one that includes a healthy diet, physical activity, appropriate weight, and no smoking—can lower the risk of certain chronic diseases and boost overall health and well-being. Scientists are very interested in the possibility that a healthy lifestyle might delay, slow down, or even prevent Alzheimer's. They are also studying the role of social activity and intellectual stimulation in Alzheimer's disease risk. Learn more about cognitive health and older adults. Yes, there are several possible sources of help, depending on your situation. Read Paying for Care for information on government programs and other payment sources.